Originally a gemstone having layers of different colours (e.g. sardonyx and cornelian) carved to show in low relief the design and background in contrasting colours. The earliest carved two-colour stones, dating from the period of Sumerian jewelry, were merely beads in cabochon form and sometimes stones carved in intaglio for use as seals. Later, from the Hellenistic period in the 2nd century BC, carving was done by the Greeks (and subsequently by the Romans) to produce cameos in low relief as ornamental pieces of jewelry. The art continued to a reduced extent throughout the Middle Ages and became very popular during the Renaissance when master gem-engravers worked for prominent collectors such as Lorenzo de' Medici. Thereafter, with intervening periods of more or less fashionability, cameos have been made and mounted in articles of jewelry, e.g. brooches, pendants, and especially finger rings. The leading artist of the 19th century was Tommaso Saulini. In later periods cameos were also carved in other hard materials, e.g. rock crystal, coral, jet, shell, etc., and also moulded of jasper earthenware in two or more colours by Josiah Wedgwood, or of glass paste by James Tassie. Some were copies of classical subjects and coins, but from the Renaissance period new motifs were introduced. 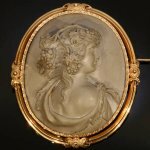 Some were made in chalcedony with either the portrait or the background painted with gold.